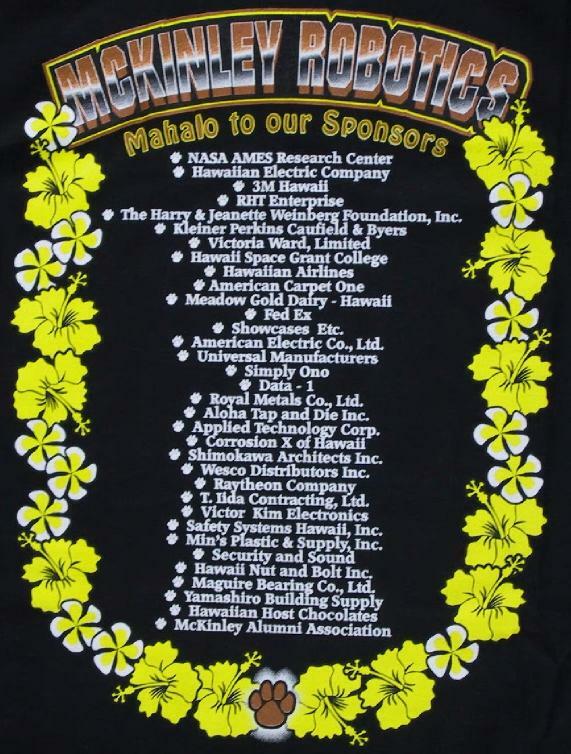 Min's Plastic & Supply, Inc.
* * Kika Mana would like to continue to proudly represent not only President William McKinley High School, but also the State of Hawaii at this year's 2002 NASA Ames Regional. For us to participate in the competition, we have been fundraising throughout the year. However, corporate donations of funds and construction materials are still needed to defray the cost of robot construction as well as transportation to the competition. As a token of our appreciation, your company's name will appear on our team apparel, website, and the robot itself. Your generous sponsorship of our team is greatly valued. If you would like to sponsor the McKinley FIRST Robotics Team, please contact Mr. Milton Lau at (808) 594-0453 or Mr. Hank Kusunoki at (808) 594-0448. For a closer look, click on the image above.